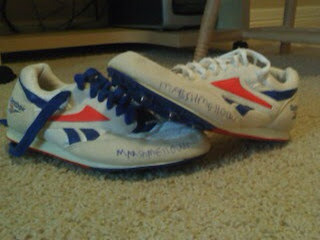 Kelsey's first track meet shoes - the coach gave her these funny Reebok's that don't fit her very well & were missing a shoelace. She nicknamed them the "Marshmellow's". After the race, a group of the other runners were hootin and hollerin at her saying, "Hey girl, like those shoes! hahahaha". Kelsey just laughed and said "Thanks, I like my marshmellow's too!" Following in her mommy's footsteps ~ Kelsey is running track. She had her first track meet Saturday February 27th! Her school came in 1st. GO BULLDOGS!!! She did 13" in the long jump, ran 4th in the relay and placed in the 800 meter sprint! She did great and plans on working on what she can do better next meet. For starters, she got some new shoes to help her.... Nike spikes! 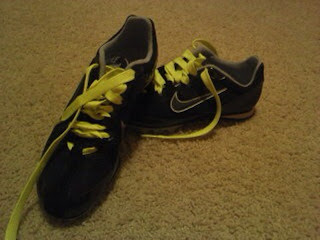 Gotta love the neon laces she added ~ running with a flare! Oh, Jeni~ Isn't that wonderful that Mary's legacy is being carried on through her children? I'm so proud of them- and you for being such a wonderful aunt to them.